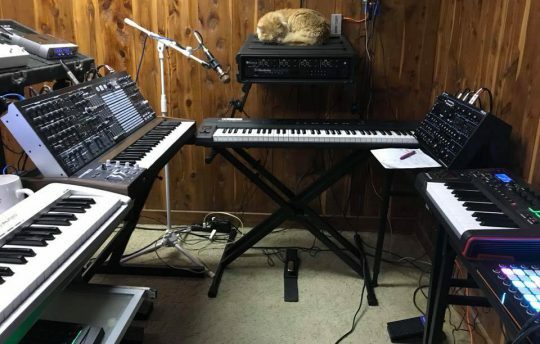 This cat has the seat of honor in this synthesizer-heavy studio. By Charles Whiley via the Facebook group Synthesizer Freaks. God I 💗 that 🐈 . And those 🎹. We identify an Arturia MatrixBrute on the left and leave the identification of the others as an exercise to the reader. Posted on February 19, 2018 March 27, 2018 by catsynth	This entry was posted in Cats, Synthesizers and tagged analog, arturia, cat, mr. maximillion, studio cat, Synthesizers. Bookmark the permalink. ← Weekend Cat Blogging with Sam Sam: Play with Me! That is Mr. Maximillion. When he’s not terrifyingly jumping around from one high perch to another or destroying the bonded leather on my brand new office chair he often settles down somewhere to relax. He’s a wonderful kitty that just showed up one day and I am beyond blessed to have him.